The Supreme Court today asked Haryana Assembly Speaker Kuldip Sharma to take a “final decision” within three months on Haryana Janhit Congress (HJC-BL) chief Kuldeep Bishnoi’s plea for disqualification of five HJC-BL MLAs who had “merged” the party with the ruling Congress on November 9-10, 2009. The Punjab and Haryana High Court today re-introduced toll fee for private vehicles on the Delhi-Gurgaon expressway, but with a “peak-hours” break. The recent spurt in crime in Haryana, particularly against the Dalits, notwithstanding, Haryana Chief Minister Bhupinder Singh Hooda is unfazed by the soaring crime graph in the state. Acting on an application seeking the revival of a public interest litigation calling for action against those assaulting and sexually abusing inmates of a Rohtak shelter home, the Punjab and Haryana High Court today sought a status report on the investigations conducted so far. The Bench fixed October 19 as the next date of hearing. The Haryana Government today approved the extension of the Metro link from Sikanderpur station to Sector 56, Gurgaon. The project, which is likely to be commissioned within a period of three years, will have the route length of 6.5 km and cost around Rs 2,143 crore. If the massive turnouts at the INLD rallies and encouraging response to HJC-BJP public meetings in the southern part of the state are any indication, it seems that residents of the region have started exploring the possibility of a viable political alternative in the Ahirwal belt. The CBI special court today discharged 1985-batch Haryana IAS officer Sanjeev Kumar and three others from two chargesheets filed under the Prevention of Corruption Act. The Maharshi Dayanand University (MDU) campus witnessed high drama last night when hundreds of girl students staged a demonstration outside their hostel. 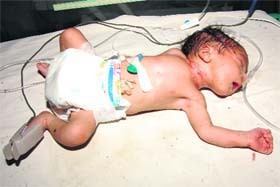 A newborn baby boy was found dumped on the roof of an abandoned house in Suchan village of Sirsa in the morning today. Some unidentified person had left the little one there after placing him neatly in a bag. The Haryana Government has given additional charge to five IAS officers with immediate effect. The 106th birth anniversary of martyr Bhagat Singh was observed by the Akhil Bhartiya Naujwan Sabha and the Desh Bhagat Yaadgar Lok Kendra at Shaheed Bhagat Singh Park here today. Two persons died and two others were seriously injured in two road accidents in Sirsa today. The injured victims have been shifted to the local General Hospital. The police has registered a case of fraud and criminal breach of trust against Kumar Apoorv, former CEO, Value First Digital Media Ltd, his wife Priya Gupta, way2sms former directors Raju Venugopal and Venu Kumar on the complaint of company’s director Gagan Chadha. Family members of the Dalit victim of the Dabra gangrape case have demanded government jobs for the victim and her brother. Irked over the Central Government’s recent decision to fix the number of subsidised domestic gas cylinders to six per year, the liquid petroleum gas dealers in the state will observe strike on October 1. The Haryana Government has decided to implement a muster roll system for all workers in the Forests Department. The Uttar Haryana Bijli Vitran Nigam (UHBVN) and the Dakshin Haryana Bijli Vitran Nigam (DHBVN) will hold open darbars in villages and release on-the-spot domestic connections to curb kundi connections, Devender Singh, Chairman and Managing Director of the power utilities, said here today. Devender Singh, Chairman and Managing Director, Dakshin Haryana Bijli Vitran Nigam and Uttar Haryana Bijli Vitran Nigam, said here today that the power distribution utilities had provided the final opportunity to villagers and farmers to avail benefits under the Bill Waiver Scheme by paying only the capital amount of bills pending since June 16, 2005. The benefit can be availed up to October 31. A mock security drill was conducted in the evening here today. District police chief Rakesh Kumar Arya said 68 police barriers were erected at all entry points to the district, including 11 barriers in the town. A Bench comprising Justices Altamas Kabir and J Chelameswar also allowed the five MLAs -- Rao Narendra Singh and Satpal Sangwan (both Cabinet ministers), Vinod Bhayana, Zile Ram Sharma and Dharam Singh - to fully function as Members of the Vidhan Sabha without any restrictions. The liberty granted to the five MLAs would be subject to the Speaker’s ruling on the plea for their disqualification. In November 2009, the Speaker had accepted the contention of the five MLAs that they had merged with the Congress. However, Bishnoi challenged the Speaker’s order by moving five separate petitions before the Speaker. Even while the Speaker was hearing his pleas, Bishnoi had gone to the Punjab and Haryana High Court challenging the Speaker’s approval to the merger. On this, a Single Judge bench had directed the Speaker on December 20, 2010 to dispose of the issue within four months. The Speaker challenged the HC order before a Division Bench (DB). The DB passed an order on December 20, 2011, upholding the order of the single Judge. In addition, the HC declared the five MLAs as “unattached” members and restrained them from discharging their duties as MLAs, pending the final decision by the Speaker. All the five MLAs, Bishnoi and the Speaker then came to the SC, challenging the HC verdict. In its verdict, the SC set aside that part of the HC verdict which had restrained the MLAs from discharging their functions, but upheld the directive to the Speaker to dispose of the disqualification pleas within a time-frame. Senior advocate Nidhesh Gupta, arguing for Bishnoi, had contended that the delay in disposing of the disqualification pleas was against the democratic values and principles and the anti-defection law. Appearing for the Speaker, Solicitor General Rohinton Nariman had argued that the HC order had foreclosed the Speaker’s options. The “merger” of the JHC(BL) had provided majority to the Congress, which had won 40 seats in the 90-member House in the October 2009 Assembly poll. Easing the pressure on the brakes applied on the collection of toll tax on September 4, a Division Bench of the high court this morning ordered that toll would not be collected from private vehicles on the expressway from 8.30 am to 10 am and again from 5.30 pm to 7 pm. The orders came into force from 7 pm this evening and would continue till October 3, when the court would have a re-look at the traffic situation on the expressway before passing further orders. As the case came up for resumed hearing, the Bench of Justices Satish Kumar Mittal and Inderjit Singh showed little confidence in the decisions and actions taken by the concessionaire, Delhi Gurgaon Super Connectivity Limited (DGSCL). “You take decisions a 100 times. What immediate steps are you taking tomorrow to bring relief to commuters?” the Bench questioned. The orders come within weeks of the high court directing that toll tax be charged from commercial vehicles. The Delhi Municipal Corporation had earlier moved the high court seeking directions for imposing toll tax on commercial heavy vehicles. The corporation asserted that commercial vehicles were entering Delhi from Gurgaon side to avoid toll tax. As a result, the rush had increased on the expressway and its effect could be felt right up to Dhaula Kuan in Delhi. It added that a dedicated lane could be earmarked for commercial vehicles for the purpose of collecting toll tax. The Bench had earlier restrained Delhi-Gurgaon Super Connectivity Ltd from collecting the toll after observing that the concessionaire had failed to avoid chaos and free flow of traffic on the expressway. he directions came after the Gurgaon Traffic Police moved the high court alleging that the concessionaires were responsible for the chaos on the expressway as they did not have the requisite staff to deal with traffic resulting in snarls. The police also submitted that the concessionaires were unwilling to spend money on ensuring smooth flow of traffic, but only wanted to collect money. On July 5, the high court had directed the concessionaire to augment its manpower to avoid traffic chaos and ensure free flow of traffic, but it even failed to set up extra toll collection points as per court directions. At an interaction with the media here today, Hooda came up with an interesting explanation for the burgeoning crime graph: he said that strict instructions to the police to register first information reports (FIRs) in all cases had pushed up the crime rate in the state. When his attention was drawn to the fact that heinous crime had become a way of life in Haryana with the state reporting three murders, an equal number of kidnappings, two rapes, two dacoities and robberies and one dowry death daily, Hooda tried to put up a brave face. “The incidents of crime have fallen in recent years and that is why outsiders are investing in the state,” he reasoned. Hooda claimed that prompt action was being taken in all cases, including the recent gangrape of a minor girl in Hisar district. “The atrocities against Dalits are a heinous crime and nobody, irrespective of the caste, would be spared and the law would take its own course,” he asserted. While the Chief Minister claimed that there had been a reduction in crime in recent years, the statistics show otherwise. The state registered 1,061 murders in 2011 -- 58 more murders than 2010. As far as kidnappings are concerned, last year’s tally was 960 as compared to 956 in 2010. In a pointer to the status of women in Haryana, 723 women were raped in the state last year as against 713 in 2010. 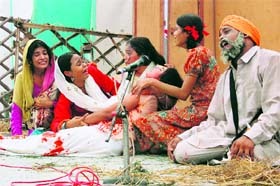 While 2,739 dowry cases were registered last year, 256 dowry deaths were reported as compared to 286 in 2010. Hooda’s claim on the registration of cases seems to be right with figures showing that 82,976 cases were registered under the IPC and the Local and Special Laws (L&SL) in the state in 2011. The “Crime in India-2010” report released by the National Crime Records Bureau (NCRB) of the Ministry of Home Affairs last year has dubbed Haryana as the twelfth most criminal state in India with 80,892 cases in 2010. On July 19, the high court had disposed of the PIL filed by advocate Utsav Singh Bains by handing over the probe to the Central Bureau of Investigation CBI. The court had given it two months to complete the investigation. The application has now been filed on the ground that two months have expired, but the CBI is yet to chargesheet three of the 10 accused involved in the case and the probe is not yet over. “Keeping in view the extreme sensitivity of the matter as also the gross abuse, torture and exploitation of 103 minor children/inmates at Apna Ghar, Rohtak, which was reported to this court in a report dated June 12, it would be in the interest of justice that this court may revive the hearing of the writ petition to ascertain the current status and position of the matter since the investigation has not been completed within the stipulated two months,” the plea read. The approval was granted by the state Cabinet, which met under the chairmanship of Chief Minister Bhupinder Singh Hooda, said a spokesman. The project would further strengthen the much awaited Mass Rapid Transport infrastructure in Gurgaon, he added. The project has the provision of further extension of the Metro Rail towards old Gurgaon across the National Highway, which will also be taken up subsequently for the benefit of residents living on the north side of Gurgaon, the spokesman said. M/s IL and FS Rail Limited would implement the project under the public private partnership (PPP) model and the entire cost of the project would be borne by M/s IL and FS Rail Limited. The Haryana Government would provide right of way (ROW) on lease hold basis. “This is a unique model for implementation of Metro Rail projects in the country wherein not only the entire project cost will be borne by the private party but it will also be maintained and operated by the private party at its own cost,” he said. M/s IL and FS Rail Limited would also pay Rs 2,010 crore to the state government towards connectivity charges over a period of 20 years starting from 16th year from the date of signing of the concession agreement. The private parties would also share with the state government 5 per cent to 10 per cent of the revenue generated from the property development and advertisements rights during the operation period. The project would be a boon to the existing Metro Rail project being developed in the Cyber City of Gurgaon, the trial runs of which would take place on October 2, 2012, in the presence of the Haryana Chief Minister. In the given political scenario, BJP’s national convention at Surajkund also comes as a much-needed shot in the arm for party cadres as well as alliance partner HJC’s followers. BJP leaders owing allegiance to the region maintain that the party’s national executive meeting and rally at Faridabad would infuse enthusiasm among the party members and give an impetus to its presence and prospects as a political force to reckon with in Haryana. INLD chief Om Prakash Chautala has succeeded in striking a chord with local masses by talking of bias against south Haryana and promising a university for Rewari. At his largely attended parivartan rallies, Chautala has attacked the Hooda regime as well as ‘rebel’ Congress leaders of the Ahirwal belt. HJC president Kuldeep Bishnoi has also held a series of public meetings and described the attendance as ‘encouraging’. He focused on the issue of residents of local villages being cheated by the Congress government in the name of developing SEZs in the area. The ‘rebel’ Congress stalwarts owing allegiance to the region are conspicuous by their absence from the scene, at least for the time-being. Prominent Congress leaders, including Gurgaon MP and former union minister Rao Inderjit Singh and Rewari MLA and senior Haryana Cabinet minister Capt Ajay Singh Yadav, have been critical of the Chief Minister. However, they are apparently not confident to get a clear mandate in their favour without the party banner. Or, they may be waiting for an opportune time to disclose their cards. Besides Sanjeev Kumar, the court discharged Kiran Mishra, district project coordinator (DPC) at Jind; JP Bhatnagar, a clerk in the DPC’s office, and Sushant Swain, a store keeper in the DPC’s office. A scheme was formulated by the state government to promote education amongst children in rural areas in 1999. Under the project, puppet shows, slogan writing and wall paintings were proposed in various districts of the state. Defence counsel Deepak Vadehra said the CBI had alleged in these two chargesheets that the accused had committed fraud while purchasing video CDs and printing posters for the scheme. But the CBI had failed to prove these allegations. Meanwhile, the court deferred hearing in another chargesheet related to the purchase of projectors for the scheme to October 30. Early this year, the special CBI court had discharged Sanjeev Kumar and 10 others in a corruption case involving printing of textbooks. The textbooks scam had hit the headlines in 1999 when Sanjeev, the then state project director of the Haryana Prathmik Shiksha Pariyojna Parishad (HPSPP), had allegedly approved tenders for printing and publishing books to three private agencies at rates much higher than the government rates. They were protesting against the manner in which the authorities handled the incident in which a girl student of MBA was found unconscious during a function on Thursday. The protesters charged the authorities with not providing adequate security to the students on the campus. Though the protest came to an end after the intervention of the Vice-Chancellor, the girls threatened to go on strike if their issues were not resolved by Monday. “The problem erupted around 3 pm on Thursday soon after a function of the IMSAR department had begun as a girl, enrolled in the MBA course, was found unconscious outside a building on the campus,” said a student. She claimed that all girl hostellers who were attending the function were escorted to the hostel in a suspicious manner around 6 pm. This led to a fear that something untoward had happened to the student found unconscious. The girls assembled outside the gate of a hostel around 12 at night and raised slogans against the university authorities. The Vice-Chancellor, accompanied by senior university officials and a police team headed by two deputy superintendents of police, reached the spot. The protesting girls told them that the authorities had been hiding the truth behind the incident and claimed that the girls were concerned with their own security as no measures assured by the officials earlier had been taken so far. The Director of IMSAR, Dr H.Gosh Roy, claimed that the confusion started after the girl, reportedly a victim of epilepsy, fell unconscious and had to be rushed to the PGIMS hospital from where she was sent home. The protest came to an end after the students were assured of measures for their security like includes the installation of CCTV cameras, posting of women policeman and a PCR round the clock near the hostels. The university had to shift a hostel warden after the girl students launched a stir to demand her removal on the issue of security here recently. The house owner, Om Parkash, noticed the neonate shaking his leg, which had come out of the bag, when he went to the roof in the morning. He intimated the matter to other villagers and all of them opened the bag. They found a healthy looking newborn baby. The little one had minor bruises on his neck. After taking the child to a doctor in the village for a checkup, Om Parkash shifted the neonate to a private hospital in Sirsa. The doctor attending on him said the child must have been born a few hours before the villagers found him. The police was informed of the matter. Chand Singh, station house officer of the Ding police station, said a case of concealment of birth by disposing of the baby under Section 318 of the IPC was registered against an unknown woman. Meanwhile, a number of persons have shown interest in adopting the child. Om Parkash’s son Deepak said his uncle Mohan Lal, an issueless person, had also expressed interest and the family wanted that he be allowed to adopt him. PK Gupta, Additional Chief Secretary, Labour and Employment and Environment Departments, has been given the additional charge of Additional Chief Secretary, Industries and Commerce, Mines and Geology and Electronics and Information Technology Departments, during the training period of YS Malik. KK Jalan, Additional Chief Secretary, Irrigation Department, has been given the additional charge of Additional Chief Secretary, Town and Country Planning and Urban Estates Departments, during the training period of SS Dhillon. SS Prasad, Principal Secretary, Higher Education Department, has been given the additional charge of Principal Secretary, Sports and Youth Affairs Department, during the training period of Hardeep Kumar. Dhanpat Singh, Principal Secretary, Technical Education Department, has been given the additional charge of Principal Secretary, Agriculture Department, during the training period of Roshan Lal. Pankaj Yadav, State Project Director, Haryana Prathmik Shiksha Pariyojna Parishad, and Project Director, Rastriya Madhyamik Shiksha Abhiyan, will also look after the work of Director and Joint Secretary, Secondary Education Department, during the leave period of A Sreenivas. Baldev Bakshi, a veteran Left activist, presided over the function. Swaran Singh Virk, a senior CPI leader, threw light on the life and sacrifice of Bhagat Singh. 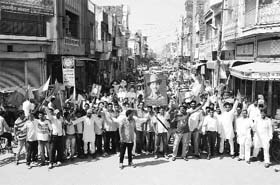 He called upon youths to come forward for eradicating corruption as this menace was threatening to waste the sacrifices made by Bhagat Singh and other martyrs. 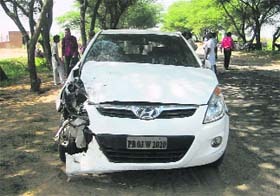 Two persons died and two others were seriously injured in two road accidents in Sirsa today. The injured victims have been shifted to the local General Hospital . In the first accident near Peepli village, village resident Darshan Singh was killed when his motorcycle collided with a i-20 car. 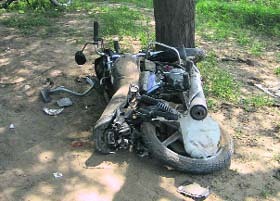 Gora, who was riding pillion, was seriously injured. The two were returning from their fields. The car driver escaped after the accident. In another accident, Chhinda Singh of Kotli village was killed when his motorcycle was hit by a tractor-trailer near Mallekan village while his nephew, Harpal Singh, who was riding pillion, was critically injured. The two were returning to their village after paying obeisance at a gurdwara at Madhosinghana village. Alleging a fraud of Rs 7 crore, Chadha stated that Apoorv proposed and made the board of directors of the company agreed to take over another company, way2sms, for Rs 150 crore. “We found out very soon that he had cheated us as Rs 7 crore went directly into his account. A probe revealed the he had duped us along with two directors of way2sms,” read the complaint which had Kumar Apoorv's bank statements indicating transfer of Rs 7 crore in installments. The complainant also named their former CEO's wife as a beneficiary of the cheating amount. Chadha further alleged that Kumar was fired from the company a few days ago soon after the fraud came to light but he allegedly issued press statements claiming that he had resigned. The demand was made at the rasam pagri of the victim's father at Dabra village near here today. The victim’s father had committed suicide on September 18 after he learnt that his daughter had been gangraped. The family members also demanded that they be provided a government house at Hisar as it had become impossible for them to stay in the village after the incident. Leaders of several Dalit organisations attended the ceremony. Ashok Tanwar, Lok Sabha member from the Sirsa constituency, met the victim’s family and offered his condolences. The strike would be held on the call given by the National Federation of LPG Distributors of India, said a spokesperson of the dealers here. He said they had been demanding that they should be allowed to have uniform refill price for the domestic supply. This was stated by Haryana Forests Minister Ajay Singh Yadav while interacting with representatives of the Forests Department Workers’ Union, Haryana, who called on him in connection with their demands here today. Yadav said the system would be implemented for workers by November this year. He assured them that the government would give sympathetic consideration to their demands. The Minister directed the officers to provide shoes, mask and safety equipment to the workers to prevent any untoward incident. open darbars in villages and release on-the-spot domestic connections to curb kundi connections, Devender Singh, Chairman and Managing Director of the power utilities, said here today. The number of households was much more than consumers in villages. The test reports submitted by the applicants would be processed immediately for providing connections, he stated. The darbars would be held from October in the areasidentified by field officers. At least two darbars will be held in each operation subdivision in a month. He said the losses in the rural sector were about 65 per cent, which was a cause for concern. The release of new connections would help minimise losses, he added. He said if they paid all bills pending since June 16, 2005, in one go, the late payment surcharge would be waived. The decision would benefit rural domestic and tubewell consumers who could not opt for the scheme by March 31, 2007 and who had joined the scheme but could not pay their bills for 20 months regularly and stopped paying their bills midway. As a result their defaulting amount on June 16, 2005, could not be waived. Arya said all vehicles and suspicious persons were checked. During the mock drill, an alarm was flashed immediately after eight men in plain clothes moved on four motorcycles without number plates, the district police said, adding that triple riders, riders with covered faces and vehicles with black films were also checked.